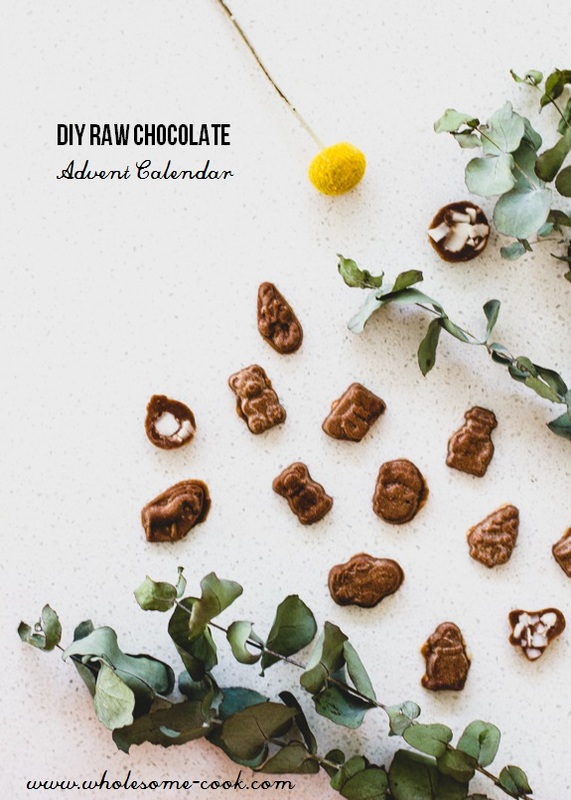 There’s something magical about Advent calendars and now you can make your very own raw chocolate and crunchy coconut version. Otherwise set the chocolate in block moulds and enjoy a square here and there during the festive season. When I was little, I loved the excitement of Christmas as much as I did the promise of a chocolatey treat behind each numbered Advent calendar door. It wasn’t even the fact that once a year, for 24 days straight, I was allowed the to have a little chocolate daily. It was the surprise of a new shape waiting in as much anticipation for a child’s beaming smile when that little cardboard lid lifted. Would it be a snowman, a gingerbread man or Santa himself this time?? I still have fond memories of those times and seeing Advent calendars in stores actually makes me smile. The idea of smaller treats dispensed over 24 days appeals to me a lot more than the Easter Egg hunts, too. And, to be honest, it’s probably one time a year when I am perfectly fine with commercially made chocolate and allow the kids some food freedom, in line with the whole 90/10 philosophy. Although I am quite a sucker for homemade Rocher Bites (recipe for those is in the book), which are quite festive and a great alternative to the store-bought ones, indeed. 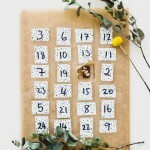 When Liana has asked if we could make our own healthier version of advent calendars this year, it was a bit of a proud moment, and somewhat of a surprise! Naturally, I agreed. I actually kept the calendars from last year because I was thinking of doing something along those lines this year. 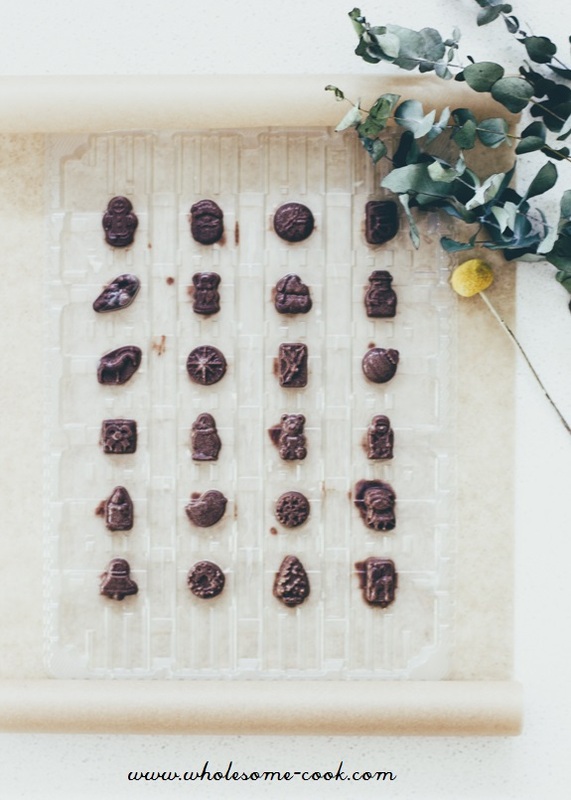 Luck had it that I have just created and shared a Coconut Crunch Maca Chocolate recipe as part of the Goodness Me Box in November and have been enjoying a square almost a day since. I’ve adapted the recipe a little further, using SupermixME blend of Cacao, Coconut and Maca, and some of their Cranberry, Pomegranate and Goji berry powder – they are both additive-free, but this is optional. As the Bioglan coconut chips are sweetened, I did not add any extra sweetener to the chocolate. 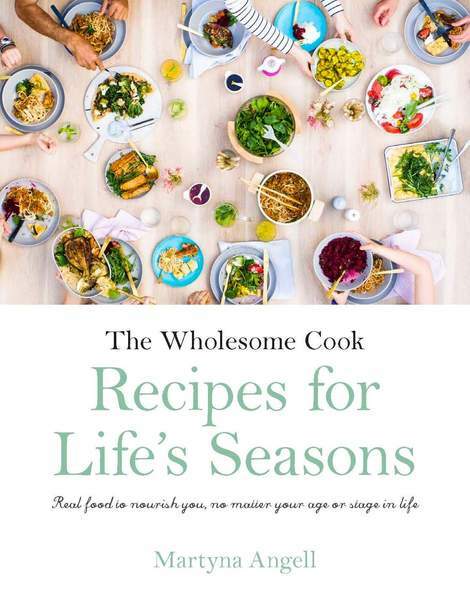 Now, if you live in a warmer climate and don’t have air-conditioning running 24/7 then you probably won’t mind the fact that these calendars need to be kept in the fridge – use this recipe for storing your calendars in the pantry or somewhere where it won’t be exposed to sunlight and temperatures over 26C. I've adapted the recipe a little further from my original that appeared in the Goodness Me Box, using SupermixME blend of Cacao, Coconut and Maca, and 1/2 teaspoon of their Pomegranate, Cranberry and Goji blend but this is optional. As the Bioglan coconut chips are sweetened, I did not add any extra sweetener to the chocolate. This is enough to fill 2 standard Advent calendars - you can buy the ones from the shops, remove the chocolates and use the mould. If the box is intact you can reuse that one, or make your own - instructions below. Keep the calendar in the friedge door - the chocolate needs to be refrigerated. 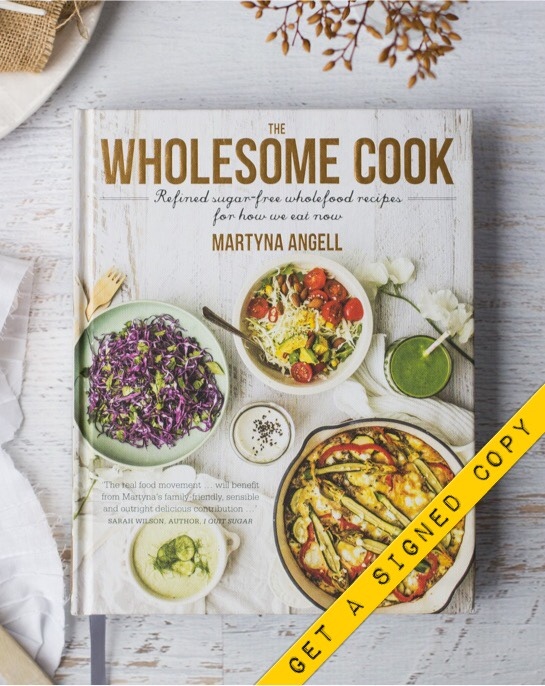 Unless you use this recipe. In a measuring jug whisk together melted coconut oil, maca if using and cacao powder. 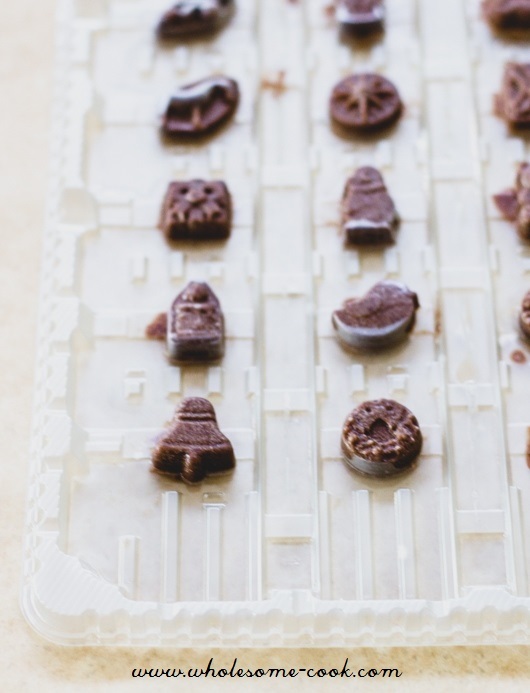 Spoon the mixture into your advent calendar moulds. 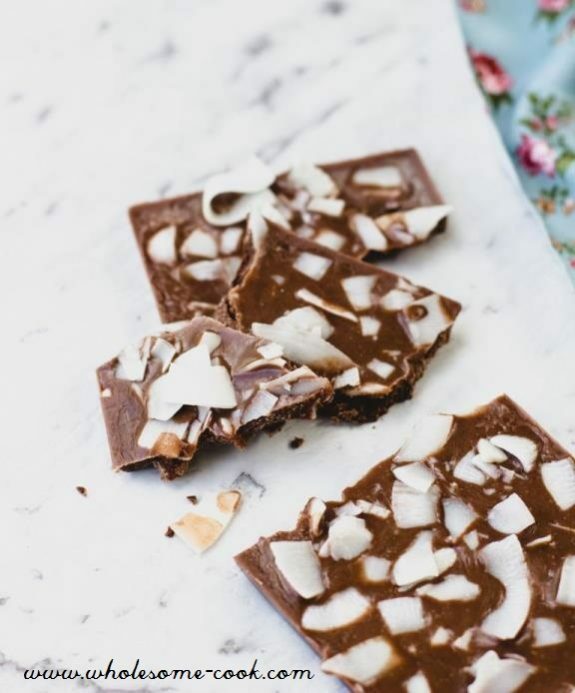 Sprinkle the top with crushed coconut chips, press them gently into the chocolate leaving some on the surface, and place the chocolate in the fridge for 20 minutes to set. 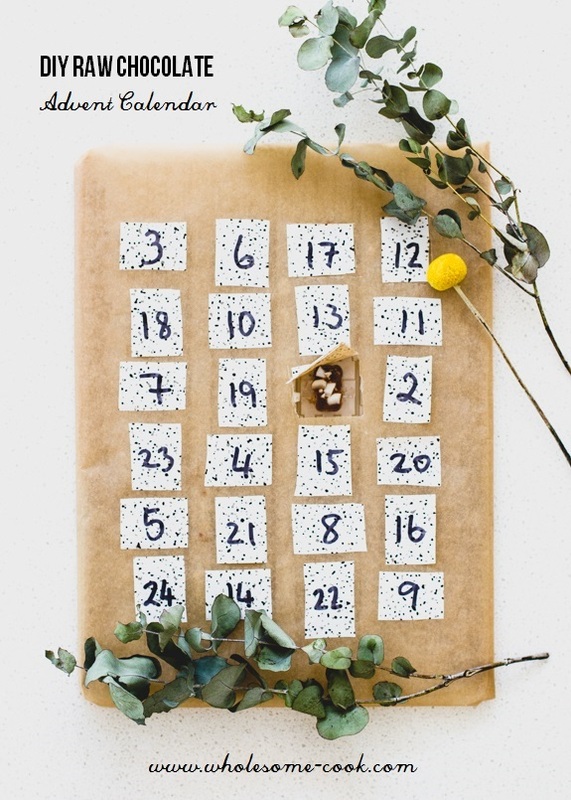 To make your own wrapping, cut a sheet of kraft or brown baking paper large enough to wrap around the whole calendar and secure at the back with sticky tape - as you would wrap a gift. Place back in the fridge. Write numbers 1-24 on the squares. 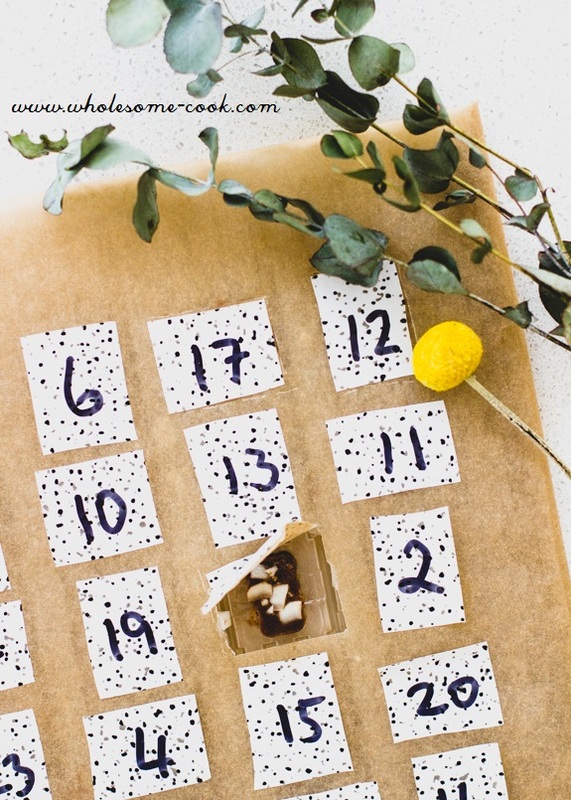 Remove the calendar from the fridge and stick your preferred stickers over each chocolate. Using a stanley knife cut alongside one edge of each sticker - this will ensure little fingers can get under and rip the paper open. Cut the adjacent two sides in an intermittent - perforated fashion. Place back in the fridge after doing a lot of 8 so that the chocolate stays set. Keep calendars in the fridge, on the door for easy access.